Now that I'm pregnant again I thought I'd shop around and see if there are any cheaper brands that are 3 or 5 free, as Essie isn't exactly the cheapest out there. 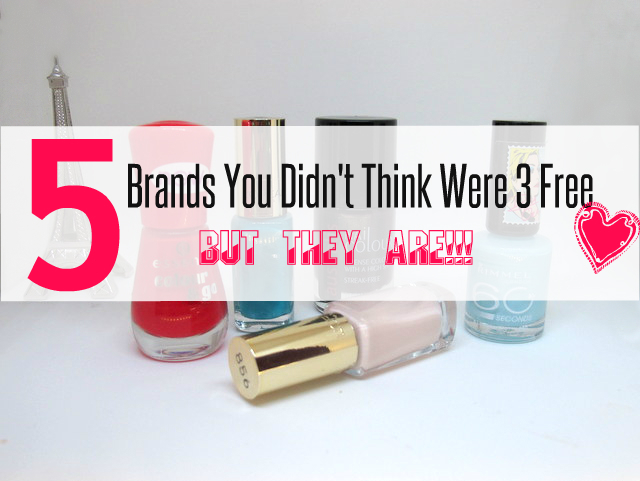 And what do you know, some brands that I would absolutely not have guessed to be free from nasties actually are! Here are the 5 brands that really surprised me, and made me happy as they're the brands I normally wear anyway and they're all less than $10AUD each. 1. Essence - who would have thought this cheapie brand would not contain these toxic chemicals, but yep, they're 5 free! 2. Australis - I was so happy to find out Australis was on this list as I'm sure you know I love the brand, so yay, I don't have to throw out my Australis polishes! The info I found online said it's 4 free, but when I looked at the ingredients on their website I couldn't find any of the 5 toxins above. I'll have to confirm, and when I do I'll update this post. Either way, it's at least 4 free. 3. L'Oreal - I thought for sure L'Oreal would contain chemicals, I don't even know why. I think I thought only smaller, indie brands would be going the 3 or 5 free way, and L'Oreal ain't indie! But hooray, they're 5 free! 4. Rimmel - Similar to L'Oreal, I thought Rimmel would be more concerned with making money than getting rid of toxins, but ooops, my bad. They're 3 free. 5. Face of Australia - Ha! Another Aussie brand which is also 3 free. I mistakenly threw out all my FOA polishes when I found out I was pregnant, so time to replenish! You can find a much more thorough list of 3/4/5 free brands HERE. What do you think of these brands? Are you surprised they're free from all the major toxins? Hi Lilit, thanks for finding this information. This will be useful to so many who don't want to spend on Essie or Butter London and Yes I am surprised !! I love these Loreal polishes. I'm always so happy when the affordable Australian brands, like Australis and FOA, don't rely heavily on harmful chemicals - plus, they make damn good polishes!